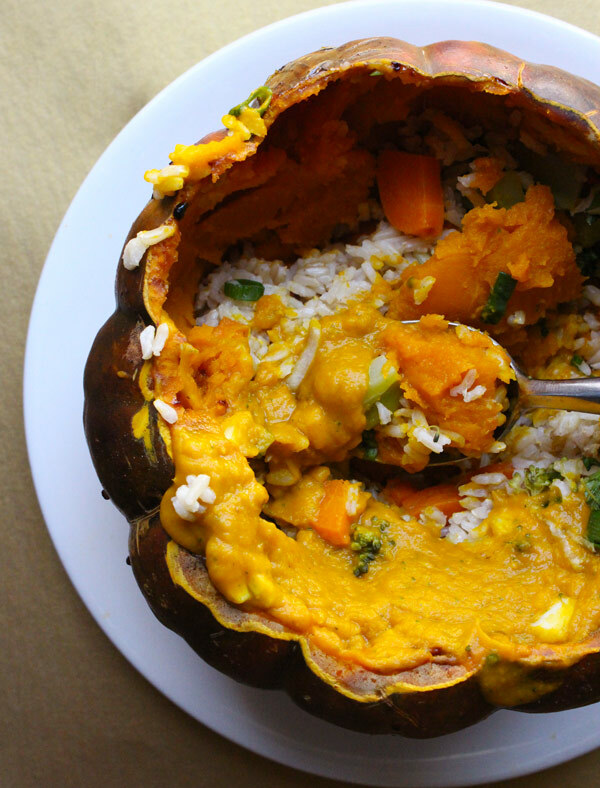 The perfect date night meal featuring a baked fairytale pumpkin, rice, lentils, and veggies smothered in fairytale pumpkin sauce. Date night isn’t the only time this meal is good, you can eat half one night, and save the rest for a lunch date with yourself tomorrow. Or you can use the pumpkin bowl as any kind of side dish holder for your Thanksgiving spread; such as stuffing, and any kind of grain or vegetable. You could also use the fairytale pumpkin sauce over your turkey, or mashed potatoes. Okay now I’m just making myself hungry! This year Dominick and I are keeping Thanksgiving low key and cooking up this dish again. We have made this recipe many different ways, with different grains and veggies, and I thought I’d update the photos for 2016. 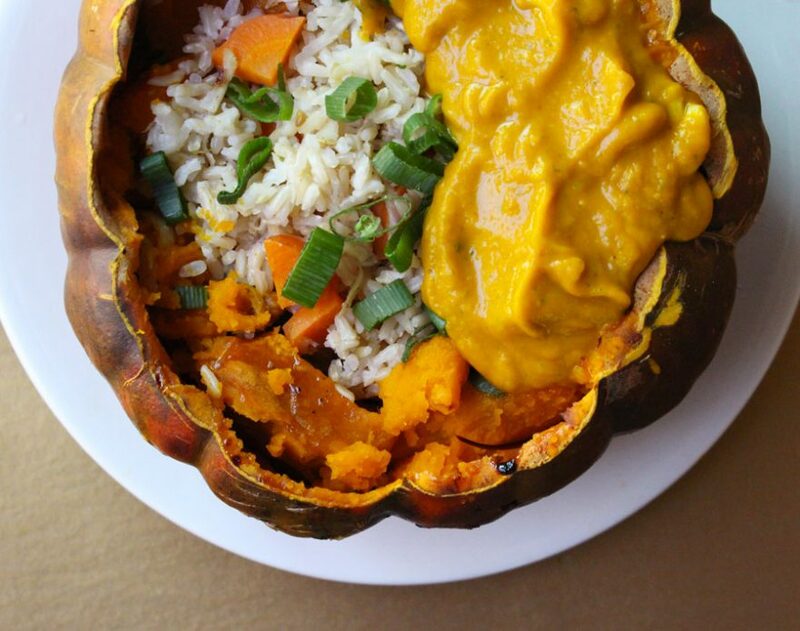 This is a simple recipe when you break it down, all you do is prep and bake the pumpkin, cook the rice and lentils together in a rice cooker, prep a few veggies, and blend together the sauce. There will be a lot of standby time which is great because you can be doing other things while it cooks! You’ll want a really sharp, large knife to cut the pumpkin. Don’t even try with a dull little knife. If you don’t have a good knife, bake the pumpkin first, and then cut carefully. Fairytale pumpkins have a lot of “meat” so half of it can be used for sauce. If cooked right the pumpkin should resemble butternut squash and will peel away from the skin like butter. 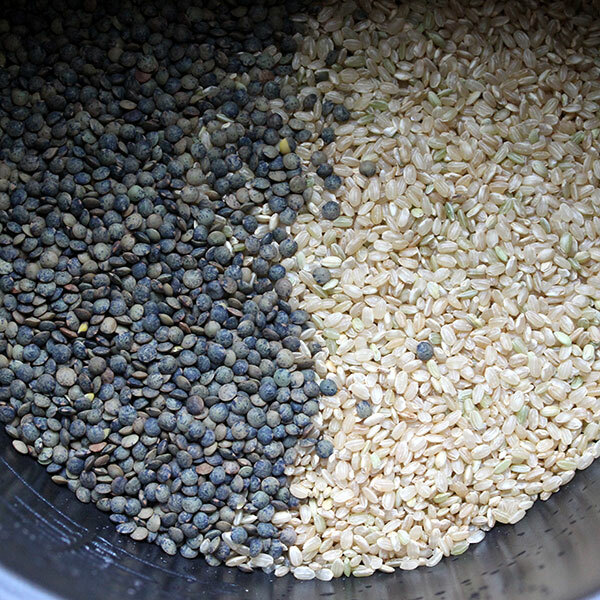 Any type of grain or vegetable can be used, you could use all rice or go with the rice and lentil combination. To cook, I generally use my rice cooker for every kind of grain so I don’t have to worry about it, just let it do it’s thing. I add my veggies directly to the rice cooker at the appropriate time, for instance broccoli, romanesco, and shredded celriac only need to cook for about 7-10 minutes, carrots take a little longer, depending on how you cut them, and onions can be added at any time to enhance flavor. Celriac is a root vegetable that tastes just like celery, parsnip tastes like a super flavorful carrot, and romanesco is like the sweet beautiful child of broccoli and cauliflower. 😉 Use any kind of vegetable, spice or herb that you prefer to customize your fairytale pumpkin bowl based on what’s available and what you prefer. Hope you all have a Happy Happy Thanksgiving!! Cut the top off of fairytale pumpkin with a large sharp knife. Bake at 350° F for 1 hour. Start cooking rice and lentils, preferably in a rice cooker. With about 7-10 minutes left on the rice and lentils, throw in the shredded celriac and parsnip, romanesco or broccoli, and diced onion. Once the pumpkin is done cooking, scrape out about 3 cups of "meat" and throw it in the blender. Add in the rest of the sauce ingredients and blend. Add the rice, lentil and veggies into the pumpkin bowl and pour the pumpkin sauce on top. Reheat in the oven at 350 degrees for about 15 minutes, or until warm.